CLAUS WEB Review 2019: Is CLAUS WEB a Good Hosting? CLAUS WEB is a website hosting provider based in Romania. They offer a full suite of web hosting services including shared cloud hosting, dedicated hosting, virtual private servers, SSL certificates, and domain registration. First established in 2005, CLAUS WEB is a leading Romanian website hosting provider. They currently serve over 100,000 customers worldwide, though most of their customers are in Romania. Their website is only available in Romanian. CLAUS WEB offers a full range of web hosting services including shared hosting, cloud hosting, semi-dedicated and dedicated servers, virtual private servers, reseller hosting, domain registration and SSL certificates. They even provide website design and search engine marketing services, so customers looking for a convenient solution have a one-stop shop for all their internet marketing needs. CLAUS WEB takes website security seriously. They offer a variety of extra features specifically to keep your website fast and highly secure, such as Cloudflare, SpamExperts Output Filter, and LiteSpeed Web Server. Also, all packages include a free Let’s Encrypt SSL certificate along with antispam and antivirus email filters as standard. Like many other web hosting providers, CLAUS WEB provides Softaculous with all their shared hosting plans. This comes with 335 free applications or scripts, which is great for beginners: with just a few clicks, you can install WordPress, Joomla, Magento, and much more. CLAUS WEB has very good pricing compared to both their local and international competitors. While their lowest-tier packages will likely be inadequate for most businesses, even their most expensive packages are still very reasonably priced. Strangely enough though, they don’t include a domain registration with any of their Business Hosting plans, though they do include it for their higher-tier regular shared hosting packages. Their pricing is also very clearly laid out. Instead of offering a misleading claim of “unlimited” traffic or bandwidth, they define the exact limit for each package. Prices are listed in Euros and Romanian Leu. They don’t offer a flexible monthly billing term; you have to purchase plans for a minimum of three months – and sometimes even one year, depending on the package you’ve chosen. They do offer discounts for purchasing a longer term though. If you move your website from another hosting company, the migration process is free of charge. There are no free trials and no freemium plan, nor is there a money back guarantee. It’s also not clear if you can easily move between plans. Unfortunately, the main downside of CLAUS WEB is their customer service provision. They offer telephone or email support, but only during working hours. Customers may also submit a ticket through their website, though the system is rather rudimentary. I have to say this seems pretty limited, especially when they have such a large customer base. A small consolation is the guarantee of 24/7 server monitoring. Also, they do have a Frequently Asked Questions section on their website, which offers some useful information in the event you’re unable to reach their support team. CLAUS WEB is an affordable web hosting provider with top-class equipment such as RAID-6 hard drives with 15,000 RPM. However, their technical support is rather limited, and most of their shared hosting plans don’t include free domain registration. 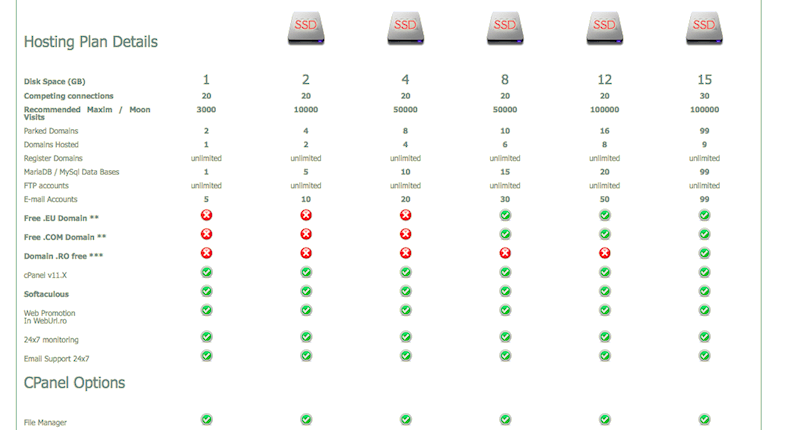 Wondering how CLAUS WEB stacks up against other Web Hosting companies? Enter any other Web Hosting company and we will give you a side-by-side comparison.